Buy Fast and Furious 7 or the rest of the Fast and Furious series cheaply from Amazon. You too can earn money from writing articles by signing up for InfoBarrel. Fast & Furious 7 aka Furious 7 is the latest film in the Fast & Furious franchise. It opens in a hospital room in London with Deckard Shaw (Jason Statham) talking to his younger brother Owen Shaw (Luke Evans), who is unconscious in a hospital bed and in a very bad way. The hospital, and the people who were guarding it, are also in an extremely bad way, with many injured and dead and the hospital itself in ruins, with all this destruction presumably caused by the older Shaw. Deckard starts off by breaking into the offices of the Diplomatic Security Service in Los Angeles to get the details on the people who hospitalised his brother. There he encounters Hobbs (Dwayne Johnson, Fast Five, G.I. Joe: Retaliation, Hercules), and a fight ensues, which Hobbs gets the worst of and ends up being hospitalised by. Deckard's first target is Han. 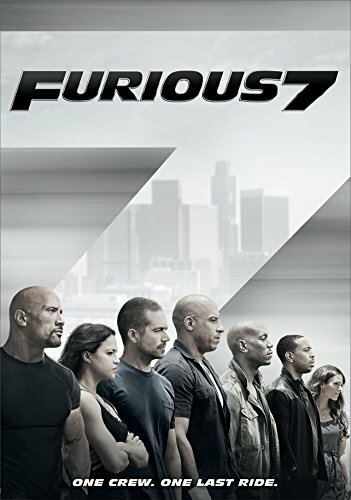 Credit: https://en.wikipedia.org/wiki/Furious_7#/media/File:Furious_7_poster.jpgLetty (Michelle Rodriguez, Machete Kills, Resident Evil: Retribution) is struggling to cope with the amnesia she is still suffering from and Brian O'Conner (Paul Walker) is struggling to cope with the responsibilities of family life and being a father. At this point, it finally gets to the time of the credits scene of the previous film, Fast & Furious 6. In that scene it was revealed that Deckard Shaw was responsible for Han's accident in Tokyo Drift and, after ensuring that Han was dead, phoned Dominic Toretto (Vin Diesel, Guardians of the Galaxy) - at which point Dom's house is destroyed by an explosion. Hobbs reveals that Shaw is a former member of Britain's Special Boat Service and a black ops assassin. Hobbs also gets the shadowy Mr. Nobody (Kurt Russell) to contact Dom. Mr. Nobody offers his help, if Dom and his team will help him. There's a hacker, Ramsey (Nathalie Emmanuel), who has been captured by a private military organisation. Nobody wants Dom's help in freeing her, in exchange for which Nobody will help him get Deckard. Dom, and his by now reduced team, with only Tej (Ludacris) and Roman (Tyrese Gibson, Ride Along 2), as well as Letty, Brian and Dom himself remaining, agree to help. Mr. Nobody also seems to be a rather atypical portrayal of the sort of black ops, suited character that he is. There then follows plenty of bullet strewn, high octane, stunt filled, explosive action across the world as Dom and friends go up against Shaw and private militaries in their attempt to free Ramsey and stop Shaw once and for all. As always, there are plenty of fast cars going fast, but the stunts have been notched up yet again. There is a scene with Sean Boswell (Lucas Black) that originally appeared at the end of the third film, Tokyo Drift. The scene from the original film has been reshot, presumably so that the new scene, in which Sean Boswell is quite obviously older than he was in Tokyo Drift - in that film he was depicted as a teenager, even if he wasn't one at the time - fitted in with the one supposedly from the original. From this point on, the film's events all take place after those of Tokyo Drift. Paul Walker, who plays Brian O'Conner, died in a car crash, in a car he was a passenger in, that was unconnected to the film, before filming was completed. This put the film on hiatus and resulted in his brothers Caleb and Cody, both of whom resemble him, performing as stand-ins for his remaining scenes and the rewriting of a number of scenes in the film, as well as the use of CGI to try to make this as seamless as possible. The final scenes of the film are a goodbye to Paul Walker, and Dom's final lines take on a different meaning, as he is not saying goodbye to Brian so much as he is saying goodbye to Paul, and there are excerpts from the previous films in the franchise. There may well be another film, although without Brian in it. The franchise has evolved from a relatively simple concept with fast cars being raced in street races in and around one city and some fairly simple stunts, to increasingly bigger stunts, with cars parachuting out of planes, and a film that is far more globe-trotting, with scenes taking place in London, Los Angeles, Abu Dhabi, Azerbaijan and Tokyo. The explosion and bullet element has also increased dramatically, with drones, miniguns, missiles and automatic cannons, and far more dangerous explosions than those connected to car crashes. There are, as always, plenty of fast cars in the film, from old-fashioned American iron to modern, extremely expensive supercars. The stunts, whilst often rather unbelievable - especially the one with a multi-million dollar supercar in Abu Dhabi - are great to watch. As the films have gotten bigger, so has the budget (up from $38 million for the first in the series to $250 million for this film), and it shows. The money is clearly being used to make the stunts and set pieces bigger and better. It is also very much a testosterone-fest, with not only Dwayne "The Rock" Johnson and Vin Diesel in it, but also Jason Statham. Statham, although a movie hard man and action guy, does not have the big, muscular presence of the other two; instead, his deadliness tends to be speed and skill - not that he is either small or lacking in muscles, he simply has a different sort of screen presence. Fast & Furious 7 is definitely a non-stop action packed fun film to watch, but it is, at times, oddly emotional, especially when related to the death of Paul Walker, and the personal issues Dom and his friends have. It has been showing now here in the Philippines for more than a week. I would love to watch this film but as of now I don't have the time. It had been out in the UK for most of a week before I managed to see it. Saw all previous episodes. Looking forward to this one. I would say I've enjoyed all of them, except 2, which was so-so.